(Seychelles News Agency) - Maritime security and combating illicit drugs are two areas where the Seychelles and the United States will collaborate, the US Ambassador said Tuesday. 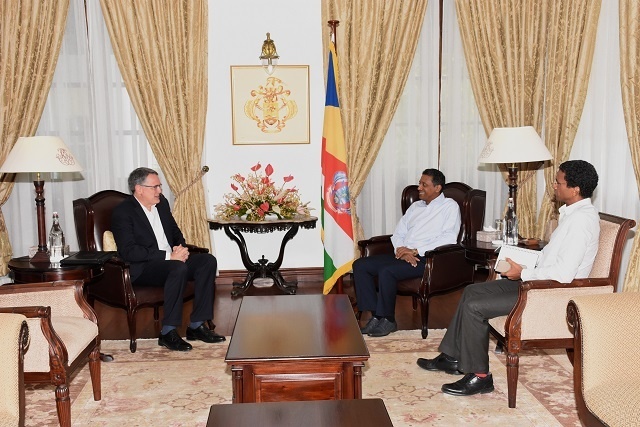 David Reimer made this statement after paying a courtesy call on President Danny Faure at State House, Victoria, where he also announced some small grants for the island nation. “As Seychelles is surrounded by great waters, we need to be vigilant always to counter the act of piracy and illegal fishing. Although vulnerable, the island needs to protect its resources at all cause,” said Reimer. Seychelles has a vast Exclusive Economic Zone of 1.4 million square kilometres, which presents a challenge when it comes to the monitoring of illegal fishing and piracy. Another area where the US and Seychelles can share expertise is on “tackling the issue of illicit drugs,” said the ambassador. According to a research by the Agency for the Prevention of Drug Abuse and Rehabilitation (APDAR), there are around 5,000 heroin users in Seychelles, an archipelago in the western Indian Ocean with a population of 95,000. As part of the prevention and rehabilitation of heroin users, a methadone programme has been put in place at the agency’s aftercare service. Around 40 percent of users following the programme has been completely clean. “The grants will be given to some non-governmental organisations to carry out their functions. It will also be distributed to help in the domain of science and engineering at school,” he said. Talking on the African Growth Opportunity Act, which was launched by the US in 2000 as a way to facilitate exportation from Africa to America, Reimer said the programme is still in operation, but as Seychelles graduated to a high-income country, it no longer needs the programme. “The income level of Seychelles is too high to participate in the programme. Nevertheless, this is a good sign showcasing progress in the Seychelles' economy,” he said. Reimer, who has served as an America diplomat since 1991, presented his credentials as American Ambassador to Seychelles in February. He is based in Port Louis, the capital of Mauritius.